The fixed length spreader can be built to virtually any length and can be designed to accommodate a variety of sling types, like wire rope or chain and at different sling angles, depending on your headroom constraints. The spreader bar ends can be offered in a "clevis" style, eliminating the need for shackles to connect the slings or pendants. 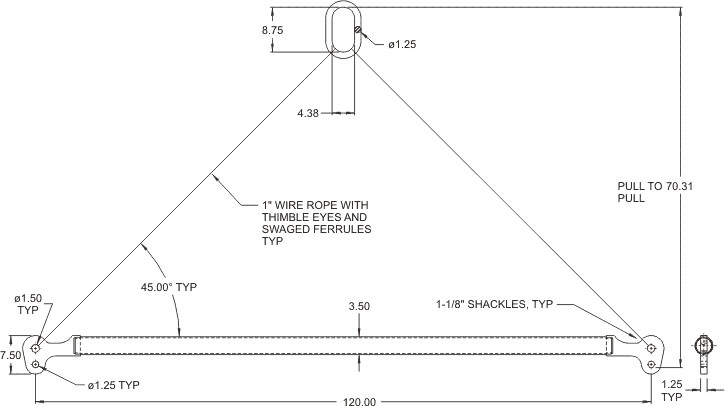 In the larger load capacities, shackles can be very expensive, so the minor additional expense for the clevis style design is often offset by the savings from not needing shackles. But if you have shackles, then you may just wish to use 'em. It's up to you! PROOF TESTED to 125% (31,250 LB) and certified.